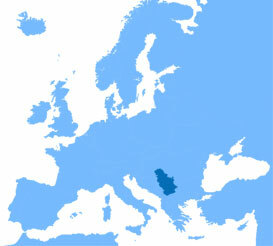 Republic of Serbia is located in the southeastern part of Europe, in the central part of the Balkan Peninsula. It represents the shortest natural connection of east and west, north and south Europe. The surface is 88.361 km2, climate is temperate continental with warm summers, and snowy winters. The capital is Belgrade, and the official language is Serbian. Most of the population is Orthodox Cristian, but there are Catholics and Muslims too, as well as some other religions. National holidays of the Republic of Serbia are New Year, Ortodox New Year, National Day, Truce Day in World War I, Labor Day, and Victory Day. New Year is celebrated on the 1st and 2nd of January, Ortodox New Year on the 14th January, National Day on 15th and 16th February, Labor Day is on 1st and 2nd of May, Truce Day in World War I is on 11th November, and Victory Day is on May the 9th. In Republic of Serbia we celebrate religious holidays too: the first day of Christmas (7th of January), Easter Holidays from Good Friday untill the second day of Easter. We celebrate St. Sava – Spirituality day, and St. Vitus Day – Commemoration of the Battle for Kosovo, which are celebrated whilst working. Saint Sava is celebrated on 27th of January, and St.Vitus is on 28th of June. Official money is dinar (RSD) – (100 para). Denominations in circulation are: coins of 1, 2, 5, 10, an 20 dinars; paper money: 10 dinars (yellow), 20 dinars (green), 50 dinars (purple), 100 dinars (blue), 200 dinars (brown), 500 dinars (light green), 1.000 dinars (red), 2000 dinars (brown) and 5.000 dinars (dark green). Most of the shops, airline companies, hotels and restaurants accept the next national and international credit cards: Diners, Visa, American Express, and Master Card. Banks and post officies are open from 08:00 to 19:00 hours on weekdays, and some are open from 08:00 to 15:00 on Saturdays. On Sundays only duty banks and post offices are open. All banks and post offices have exchange offices, and payphones. You can find dinar exchange rate on the website of the National Bank www.nbs.rs. Groceries are open from 06:00 to 21:00 hours on weekdays and Saturdays, and from 06:00 to 14:00 hours on Sundays. Markets are open everyday from 06:00 to 17:00 hours. Organized duty service hospitals and clinics are open from 00:00 to 24:00 hours. Pharmacies are open from 08:00 to 20:00 hours on weekdays, and Saturdays from 08:00 to 15:00 hours. There are some pharmacies that are open from 00:00 to 24:00 hours. Only duty farmacies work on Sundays. Churches and monasteries close after the evening service, around 19:00 hours. One must enter dressed decently (in long trousers or long skirts, with covered shoulders and stomach). Serbian national costume has a prominent place in the culture and tradition of the Serbs. Its role through history was very important, as it was a symbol of ethnic identity, and it emphasizes the art and the aesthetic values. Until this day dresses from mostly 19th and first decades of 20th centuries are preserved, with various shapes and decorations both in women’s and men’s costumes. A special costume characterize each area inhabited by the Serbs through the history. Costumes tell you not only where one is from, but what etnicity or nationality he or she belongs, which is the most prominent in the mixed comunities. One can drink the tap water, and there are public fountains with drinking water in most cities. Serbia has a number of high quality bottled waters too. Visas and travel passes: EU nationals enter Serbia without visa, and they can stay for up to 90 days. Organized tourist groups from other countries are issued a tourist passes that are valid for 30 days. Individual travelers from countries outside the EU can stay in Serbia until the expiration of their visas. Customs regulations: personal items that tourists need during their stay in Serbia are not subjected to payment of custom fees. Foreign tourists may carry unlimited amounts of foreign currency, but they must report it when entering Serbia. Air Serbia , as well as many European and foreign airlines have regular flights from Belgrade to the world. It is very extensive network of railway transport linking the Republic of Serbia with all parts of Europe, both day and night trains. Bus lines connect all parts of the country. There are international bus routes traffic to the neighboring countries and to most European countries.